You turn the radio on and they’re hyping a winter storm that’s moving in. Your reflexes kick in and you immediately grab your Dutch oven. It’s instinctual. 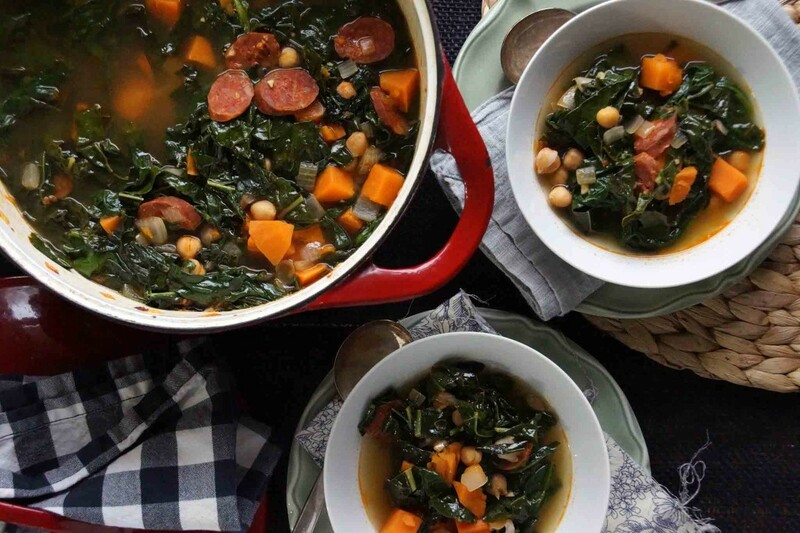 It’s time for a hearty cold-weather soup. Here’s a good one to get you through the first or thirtieth storm this winter. 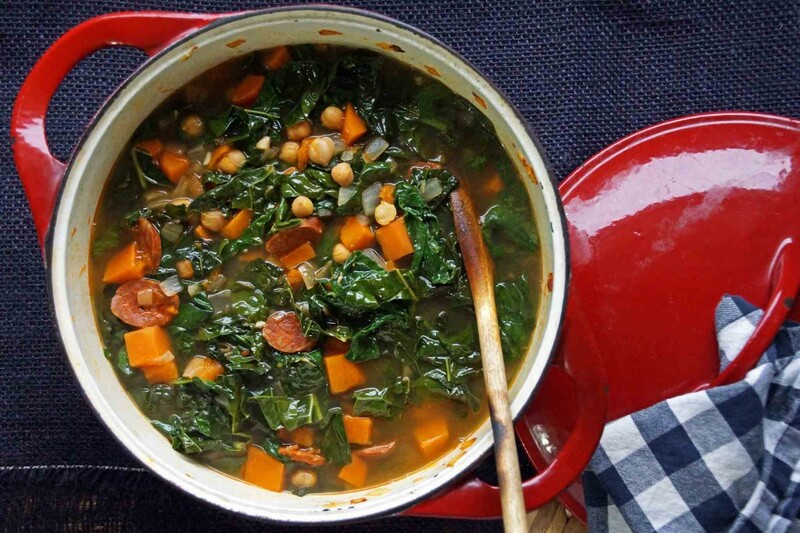 It’s a stick-to-your-ribs combination of chickpeas, sweet potatoes, chorizo sausage, spinach, and kale simmered with smoked paprika and cumin. It’ll warm you to your core. It might even leave you hoping for more cold, miserable days. Umm…maybe not, but it’s a good soup and you should give it a go. 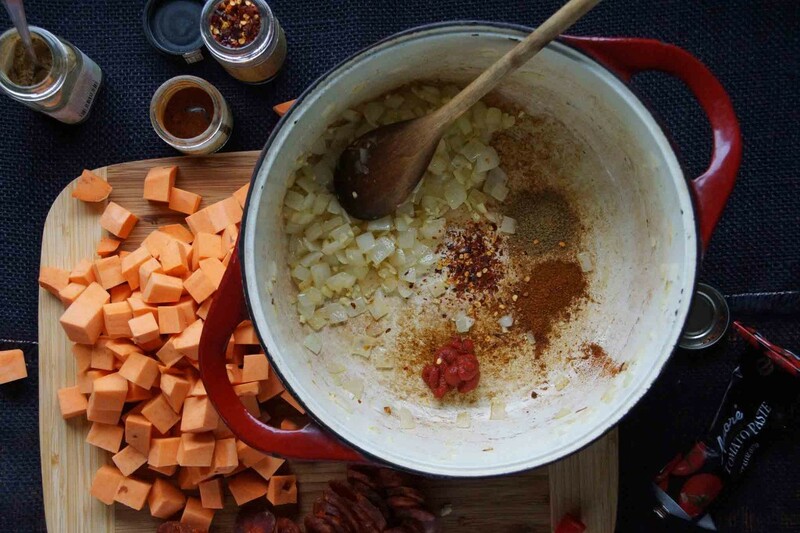 Cue the crummy weather, grab your Dutch oven, and let’s make a big batch of soup. 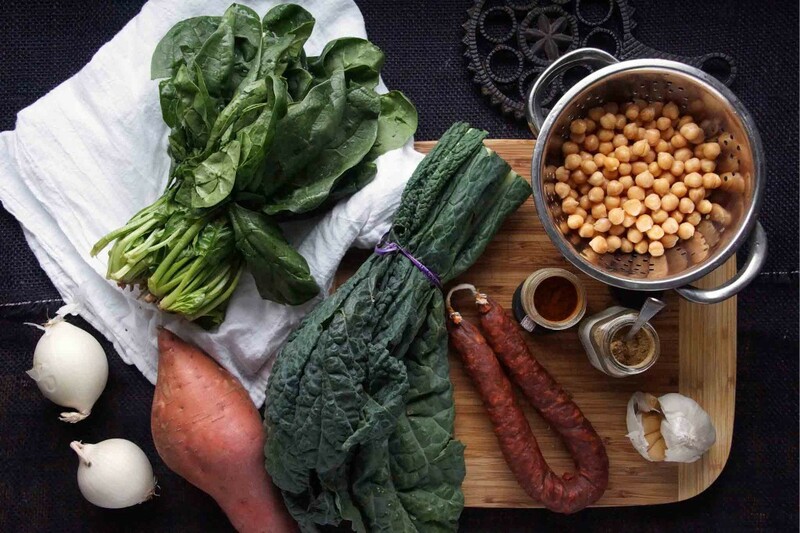 We’re going to need chickpeas, a sweet potato, spicy Spanish chorizo, and lots of greens. We’ll flavor it up with smoked paprika, cumin, and a few pinches of red pepper. Start chopping. Dice the potato and onions, mince the garlic, slice the chorizo. 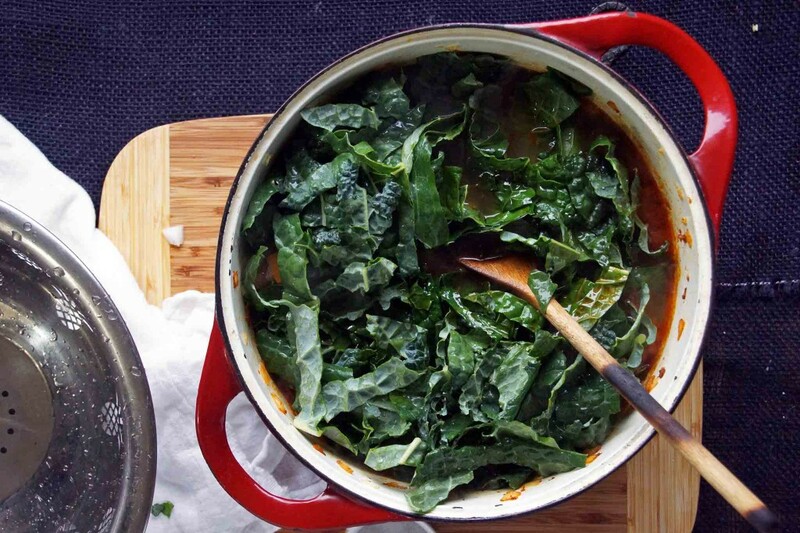 Give the greens a bath and you’re ready to get cooking. Build your flavor base. Sauté the onion in a little olive oil, add the garlic. Move the onions to 1 side, drop the spices and a dab of tomato paste in the empty side of the pan to toast for a minute, then stir it all together. This is smelling good. 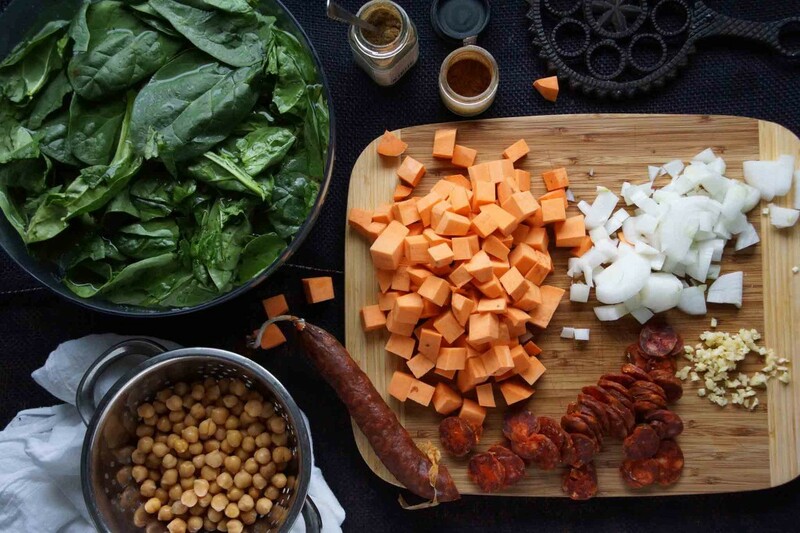 Stir in the sweet potato chunks, chickpeas, and chorizo. Sauté for a minute to let the potatoes and beans pick up all the flavors. Pour chicken or veggie stock in the pot to cover everything by an inch or so. Simmer until the potatoes are close to tender, then add kale, and, a few minutes later, the spinach. Cook for a couple more minutes until the kale and spinach are tender and you’re tummy’s rumbling. Grab a bowl and fill ‘er up. This whole “winter” thing? Ha! We’ve got it under control. 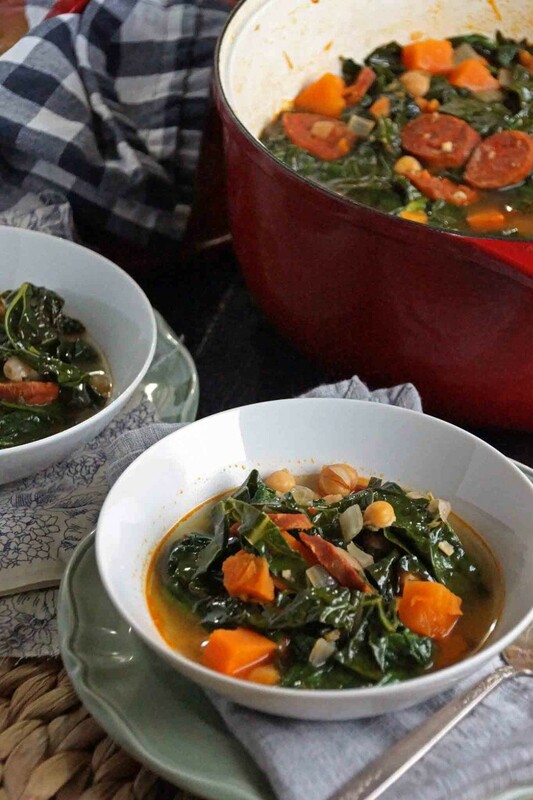 This soup goes together quickly and will warm the chilliest days! Heat olive oil in a Dutch oven or soup pot over medium-high heat. Add the onions and a pinch of salt and let them sweat down until soft and translucent, about 5 minutes. Add garlic and sauté for another minute, until the garlic is fragrant. Move the onion and garlic mixture to 1 side of the pan and drop the tomato paste, paprika, cumin, and red pepper in the other side to toast for a minute. When you start smelling the toasted spices and the tomato paste has darkened slightly, stir them into the onion mixture. 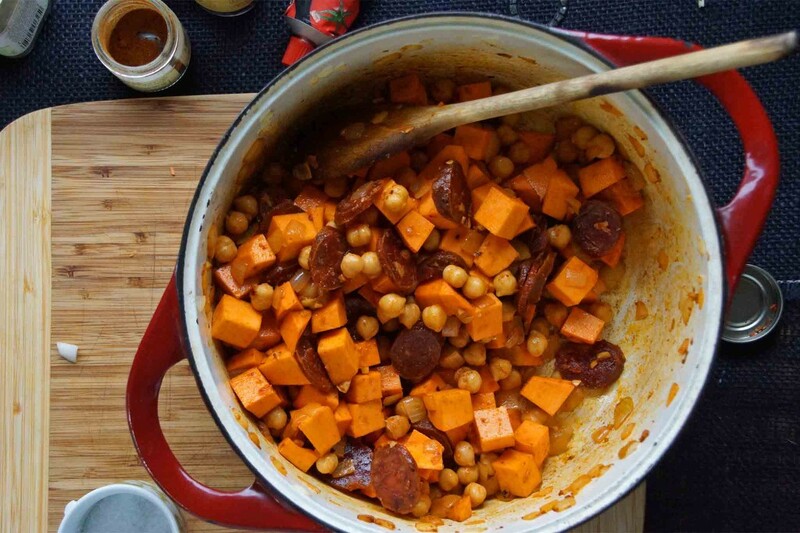 Add the sweet potato with a pinch of salt, the chickpeas, and chorizo to the pot. Stir to combine. Pour in enough stock to cover the sweet potatoes, chickpeas, and chorizo by about an inch. Bring to a boil, then reduce to a simmer. Simmer, partially covered, until the potatoes are nearly tender, 8-10 minutes. Add the kale, simmer for 5 minutes, then add the spinach and simmer until tender, about 2 minutes. Taste. Season, if needed, with salt and pepper. This looks amazing! And I’m even stocked up on chickpeas and sweet potatoes! Do you think Swiss chard would be good in this? I believe we still have it in the garden… in spite of the snow! Perfect and your Swiss chard or any other hearty greens would be just as good as the kale! 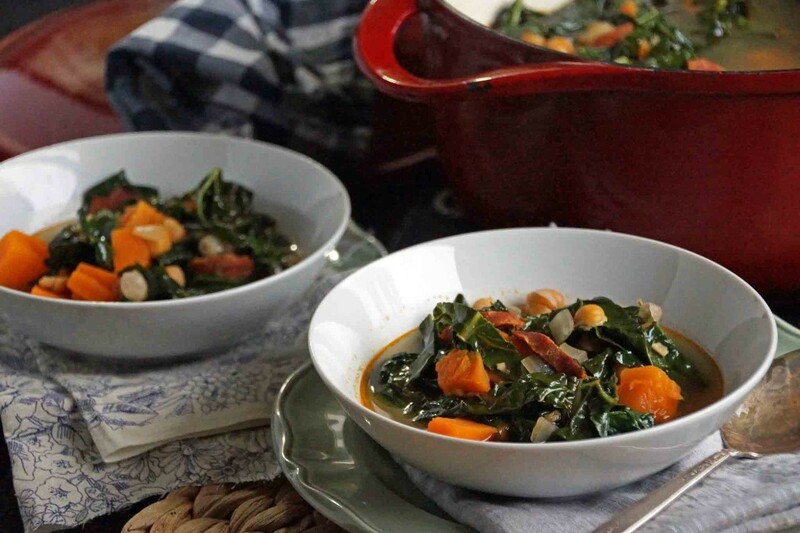 I found this blog on tasteologie and made a double batch of this soup last night. It was (and is- I’m currently having some for lunch) super delicious and I’m excited I found such a warm, healthy soup to add to my regular recipe box. I am also excited to make your recipe for cider braised pork over polenta. 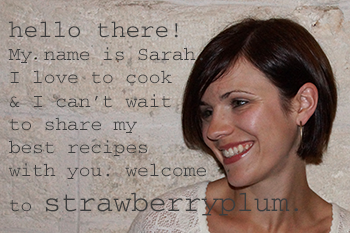 Your blog has recipe after recipe of the seasonal dishes I really want to make when the weather changes. Thank you for sharing them! What a great hearty set of ingredients, can’t go wrong with that!